We know that for some breeds of dogs, there is a never-ending shedding problem. If you have a breed of Husky, Retriever, Pyrenees, or Saint Bernard, dog shedding may seem like a constant problem. Both summer and winter coats need to be shed to make way for the upcoming season leaving fur to clean up. You can get a jump on dog shedding by regular grooming and brushing, in between visits. Regular grooming of your pet with baths and brushing can establish a deep bond with your best friend. Once your pet is accustomed to the routine, he/she will come to love the closeness with you and appreciate the one-on-one time, much like a child would. We recommend some basic care techniques for pet owners who want to manage their dog’s shedding. A high-quality brush is your best defense against dog hair. Regular brushing, even daily for some coats, can be soothing and a bonding experience for you and your pet. Select a brush that is designed to move with the contour of your pet’s body and gently removes all shedding hair. Using a soft or firm finishing brush will give your pooch the shine you desire. Bathing your dog is a great way to loosen hair and control shedding in your home. A soapy bath with the right shampoo will not only keep your dog’s coat clean and shiny, but all take away some of the hair before it sheds onto your floors. Depending on the breed of dog, frequent trips to the groomers can be a great help to shedding. Dogs that receive frequent haircuts, blowouts, and de-shedding treatments will create less of a mess in your home. While your dog will always shed, you can take a proactive role to ensure shedding does not take over your life. Keep your home vacuumed, and have a lint roller nearby. Taking a slightly damp washcloth to surfaces in your home will quickly remove pet fur. Taking care of your best friend can provide both you and your pet with an incredible bonding experience. While your goal is to control dog shedding, you also add the extra benefit of spending close one-on-one time! Snow white-colored dog hair is absolutely beautiful. Keeping your best friend’s coat this pure color may not be an easy grooming task. Grooming a white haired dog to maintain his/her beautiful color takes dedication and a bit of know-how. Frequently brushing your dog is a great way to keep white fur looking its best. This loosens up any dirt before it has a chance to stain. Experts agree that when you have a white dog, a quick daily brushing is one of the best defenses against grime. Many white haired dog owners believe that the key to snow white fur is frequent bathing. However, you do not want to bathe any dog too often, so be careful not to schedule a dog bath or grooming appointment more than once per month, unless necessary. Frequent baths can lead to problems. Then, about once per month, use a high quality shampoo. Be careful of bleaching techniques that can be harmful to sensitive skin. Instead, have a few soft washcloths dedicated to this cause that you keep in a specific spot so you remember to gently clean the eyes in the morning, as well as the beard/muzzle area after meals or trips outside. 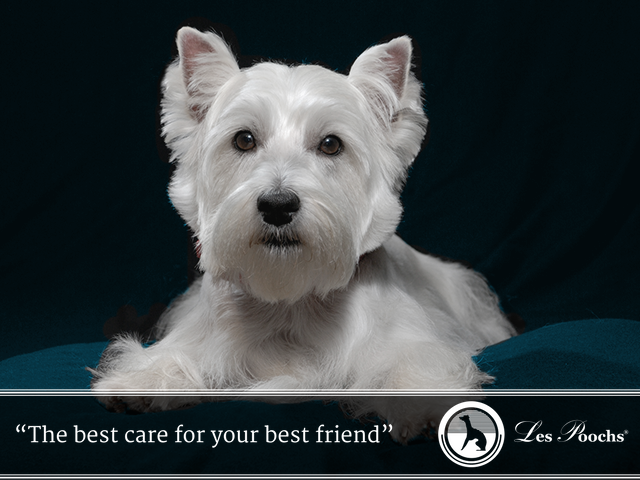 Here at LesPoochs, we want to help you provide The Best Care for Your Best Friend. We know how important your pooch is to your life. All dogs require a bit of extra care based on breed and size, and we are here to help you keep your pet looking its best at all times. Many pet owners believe that giving your a dog a bath is a messy production. The truth is that in between visits to the groomer you can make sure your dog remains clean and smells fresh with a simple bath. But, when you want to provide the best care for your best friend, giving your dog a bath may be a bit stressful, especially the first time around. How often should you give your dog a bath? Most experts agree that every 4-8 weeks every dog should get a bath. This depends on breed, activity level, and how the dog smells. Some dogs need a bath more often than others if they spend time outside or have a particular odor that is not to an owner’s liking. If your house smells like dog, or if your dog starts to smell, it is probably time to give your dog a bath! If you are going to bathe your dog often, then you should use a dog shampoo that is formulated to be gentle and conditioning to the skin. Frequent bathing can lead to dryness, and a specially formulated pet shampoo will ensure the skin is not irritated and does not dry out. Should I hand wash my dog? Hand washing your pet is recommended for close bonding with your furry friend. When you use your hands it also allows you to do a general check of their skin and fur. For instance, while using your hands, you can feel for dry patches of skin, or bumps that may need further attention. How do I wash my dog? How you wash your dog will be largely determined by the size of your pet. Some dogs can take a bath in the kitchen sink or a small basin, while others require a bathtub or shower. Give your dog a good brushing (link) before starting the bath. Make sure you thoroughly rinse your dog and then work the shampoo into the fur in some pattern. Your dog may be anxious, so be reassuringly firm. Give your dog a good rinse so there is no shampoo residue left behind. Then follow this by another good brushing. 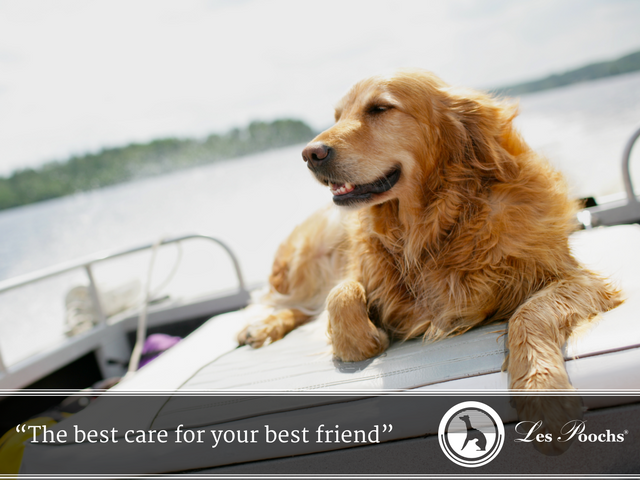 Here at Les Poochs, our motto is “The Best Care for Your Best Friend.” We want you to feel safe and assured that you are taking care of your four-legged pal in the best way possible. Dog safety is a significant concern to pet owners at this time of year. 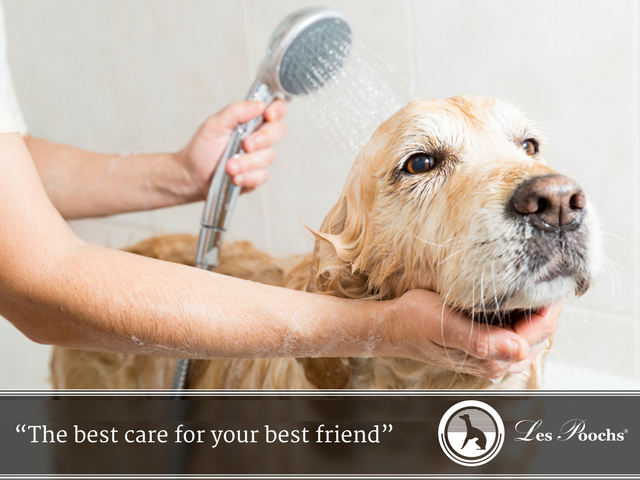 Here at Les Poochs, we desire only the “Best Care for Your Best Friend.” This is why we produce our shampoos and dog perfumes with the highest quality ingredients so you know you are bathing your pet with the best possible product. As a pet owner, you know the importance of providing the highest quality care for your pet, and the summertime is one season where you should be extra cautious. If you are accustomed to exercising outdoors with your pet and/or having your dog in the car while you run errands, there are certain precautions to take as the weather heats up. Internal car temperatures can quickly reach dangerous temperatures even in the shade with the windows open. Temperatures inside your house can also be a problem for dog safety, so if you leave your dog home alone, always leave the air conditioning on. This tip includes when you are home and also when you go out. Even if your dog is in air conditioning, they are going to require more water during the hot summer months. If you take your dog out in the heat of the day, your pet could quickly overheat. Morning and evenings provide a break from the sun, and cooler temperatures in the air, not to mention, the cooler temperature of the ground (which is better for sensitive paws). For some dogs, their coat can be as hot as walking around with a fur coat, which can be a problem as summer heats up. A groomer can make sure that fur is kept manageable so your pet looks perfect, but is also comfortable. From your backyard pool to the ocean and lakes, your dog may love to swim. Just be careful that your pet knows his/her limits and is under your supervision at all times. Like your children, your dog may be an excellent swimmer, but should never be left alone in water. Of course, take care of your dog’s fur and skin with a bath to remove chlorine, salt, and lake water . A good rule of thumb for summer dog safety is that if it seems hot and uncomfortable outside to you, your dog most certainly is not going to enjoy the heat. And at this time of year, it is a good idea to establish habits that protect your dog. Our pets add so much to our lives, and during summer months, it can be so much fun to run around with them outside. For the best dog safety in summer, just be careful when you are having fun!